Summer is almost done. 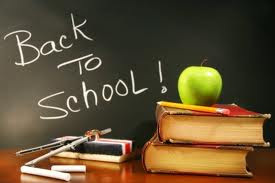 I'm not sure where the time went, but I blinked and next thing I knew it, I saw back to school supplies everywhere! So we asked our members what were some back to school tips to help kids and parents ease back into their school routine. Because let's face it, many kids have been going to bed way later and sleeping in until noon. Well, not in this house yet, but one can dream! So here it is. Tips from our member, and a pretty fun and inspiring junior high teacher, Amber. Have a 'sweater hanging rack' in the closet. Choose their weekday outfits on Sunday. It makes getting ready in the morning that much easier/quicker. If the child is old enough, have them involved in picking out their outfits. Kids start to assert independent dressing around kindergarten. Parents should also plan their wardrobe ahead of time to make mornings easier for all. Give your child input on their lunches... I cannot tell you how much food gets thrown out at school!! I believe sending more grazing/snacks works than the big sandwiches. Check out Weelicious for great bento box style lunches. You can also check out some more brown bag ideas on the momstown meals blog. Set up a specific routine for 'homework', even at a young age, your child should spend some home time working on skills...when they're young it can be the routine of unpacking their school bag, putting notes on the fridge, home reading....you need to immediately establish that learning is lifelong and doesn't just happen at school. Meet the teacher and find out the best way to contact them (agenda, email, phone, etc). If you're interested in volunteering, let them know specifically what you are interested in (Is it craft prep? Reading with individual students? Field trip supervision?). You will also need to see the office for volunteer forms and a child abuse registry form. Get the kids back to their regular bedtime schedule a few weeks before school starts. A full nights sleep is very important for learning. Thanks Amber for these wonderful tips. Be sure to check out more tips on our message board from other mom's with school aged children.